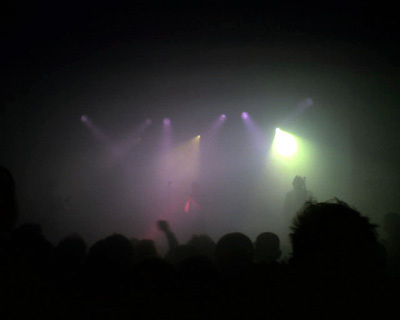 Sisters of Mercy, 30 april 2006, Melkweg Amsterdam. 20.30 - the Melkweg fills up with a mixture of dark-clad goths and not-so-young-anymore former goths trying to blend in wearing a black shirt. Background music: instrumental reggae, on an endless loop. 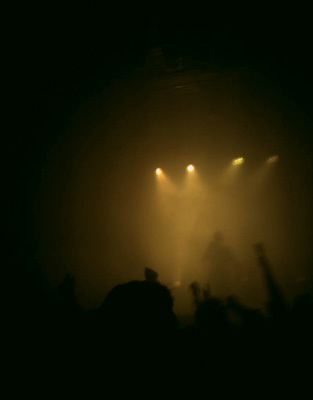 21.06 - a row of smoke machines fills the stage. 21.07 - the music starts. Three silhouettes are barely visible through the smoke. Eldritch and the guitarist on his left are wearing glasses. The guitarist on his right has hair covering his eyes instead. Eldritch's voice alternates between mumble and screech. 22.07 - the music stops. Haven't seen more than silhouettes. 22.08 - two more songs as an encore. 22.13 - the smoke has cleared up a little. The two guitarists enter the stage and perform an instrumental jam (over a typical sisters-backbeat, of course), bouncing over the stage in punk fashion (they hardly moved the first hour). They seem to have fun, oh my! The first musical moment of the evening. The guy with the sunglasses tries to put them on his head, but they keep falling over his eyes again. In the end, he settles for his chest pocket. 22.16 - Eldritch returns. One more song. 22.19 - the end. House lights go on. 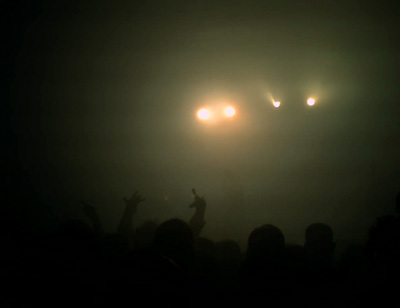 The band has disappeared, the smoke slowly vanishes. 22.34 - after a mad dash to get our coats, we're sitting in an Irish pub around the corner with a Guinness. Posted on 12:20, 01 may 2006.